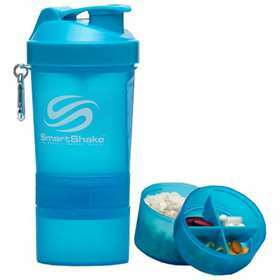 SmartShake Neon Blue 20oz Shaker has been created to hold all your nutritional supplements with its 3 compartments making life easier for you. Smart Shakers are a compact but very light design and 100% leak proof. Store in the freezer or heat in the microwave. Product code: 77090 Price: £6.49 (incl VAT) Sorry, this item is currently unavailable. Click here to receive notification when this product comes back into stock.